No sign of “my” bald eagle on this morning’s row upriver. Tonight I hopped in my kayak at sunset, armed with a tripod and my camera, and paddled downstream toward the site of last week’s amazing moonrise encounter with the eagle. Within a few moments I could tell I was in luck: the eagle was clearly visible on the same tree. 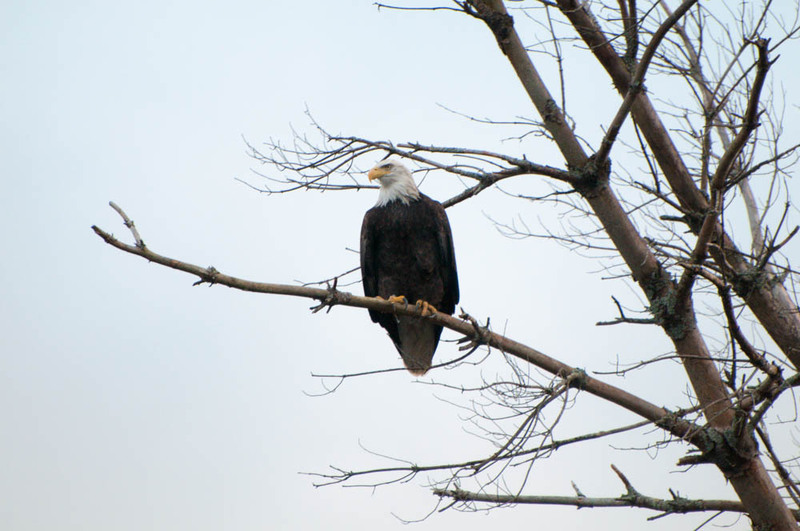 The eagle watched me as I paddled around, seeking the best angle, shooting a hundred photos. Gosh, this bird is big. When I came close, apparently too close, he became nervous and took off for a different roost. In the photos (Smugmug gallery) I can tell that he (she?) is wearing a metal band on the right ankle. I’ll try again in a few days, before sunset, when there is more light. I rowed upriver in the chilly morning air, the river calm and sprinkled with the first fallen leaves of autumn. As I neared the Grant Brook confluence, where I usually turn around, the Vermont shore began to glow. After my long sweeping turn to point myself homeward, the sun completed its climb over Smarts Mountain in New Hampshire, momentarily blinding me. As I began to row, a solitary figure flapped its way in from the sunrise, following those first sunbeams as they reached the river. My friendly neighborhood bald eagle was back, swooping low over the water, skimming the spot where I had been thirty seconds earlier. He landed powerfully but only momentarily on shore; perhaps he caught his breakfast, as he immediately climbed again, circling over the river and landing in a solitary tree, soaking up the morning sun. Some of my favorite photographs are those shots that I missed. Earlier this week I walked down to the river just as the sun was setting over the Vermont hills. (In September, early mornings bring dense fog and chilly conditions to the river valley, so it’s better to row at sunset rather than sunrise.) Ahead of me the river was glassy calm, and behind me the last rays of sunlight were turning the New Hampshire hillside golden orange. On a whim, I pointed my shell downriver, instead of my customary upriver trip. As I began rowing, I could hear the Canada Geese settling into the nearby wetlands for the evening. A large flock had settled in the silty delta of Hewes Brook, to my right. Their noisy efforts to congregate there drew my attention to the east, where the nearly-full moon was rising over the golden hills whence the brook flows. I paused to soak in this scene, while a few late-arriving geese honked their way past the moon and circled down to join their relatives in the marsh. Drifting slowly downriver, a tall snag came into view. Teetering on the leading edge of a tiny islet where the kids once hoped to find buried pirate treasure, this dead pine tree leaned over the geese and the marsh and the moon, hoping to hang on for another year until ice or floodwaters or beavers finally brings it down. It was then I saw it, shortly after the rosy sunshine had left the snag to join the shadows of the evening. Perched high in the snag, clearly visible and recognizable against the golden backlight of the hills, was the bald eagle – probably the same eagle I had seen across the river a few weeks earlier. Here was an incredible photo, with the majestic eagle boldly visible in the snag that itself framed the rising moon, against a background of golden hills and a foreground of still water with geese and late-summer marsh grasses. If I had only been there 10 minutes earlier, with a camera and a tripod and the sun still on the eagle … but I was not. So my mental camera snapped this shot and I reluctantly rowed onward. I returned 15 minutes later, heading home, and the eagle was still there, monitoring me and everything else in the growing darkness. I didn’t see my eagle friend during my row last night, where I paused again to watch the full moon rising over the same spot. I’ll hold tight to my mental photograph until I see him again.